Please remember if you're order is $150 don't use code, you will receive your own rewards! Place an online order in my store using Hostess Code NE2EPRXJ by March 28, 2015 and be eligible to receive all the rewards accumulated! 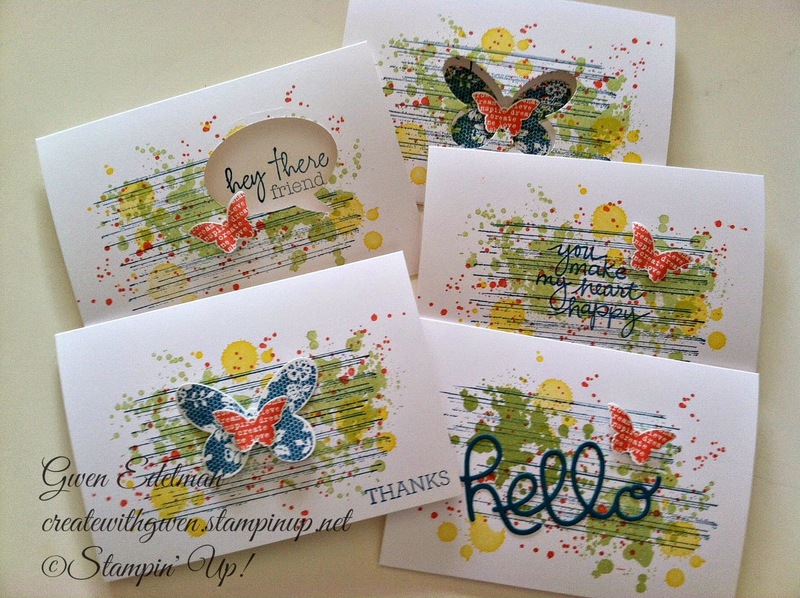 One lucky stampin friend will win FREE product and this set of Note Cards! Join us and create a pack of 10 simple, clean, and easy note cards! Perfect for sending a little note of thanks, appreciation, thinking of you…nothing feels better than receiving a handmade card in the mail! Especially when it also has a hand written note inside! Spend your Saturday morning playing with stamps, ink and paper! Cost for class, including envelopes-$6 or FREE with a $20 order before shipping and tax...or place an online order (info above) and get your set of 5 Free and be enter to win $25 worth of Stampin' Up! product rewards! This winter we're having here in Northeast Pa seems never ending! So playing with butterflies is my hope of an early spring! These note cards are quick, fun and bring a smile to brighten spirits! Enjoy!